A postcard depicting a view from the Chemin de Fer de La Mure railroad line, which was built in 1882 to haul coal and was electrified in 1903. 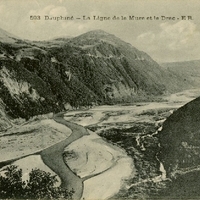 The postcard refers to Le Drac, an electric locomotive that ran on the line between 1903 and 1933. Until 2010, the line itself operated as a tourist attraction, but a landslide blocked one of the tunnels and it is unclear if or whether the line will re-open. Originally published by Phototypie Goutagn Lyon. "Le Train de la Mure Ne Circule Plus." Le Dauphine. http://www.ledauphine.com/isere-sud/2010/10/27/le-train-de-la-mure-ne-circule-plus. "Chemine de Fer de la Mure." http://www.railfaneurope.net/lamure/english/constr.html. “La Ligne de la Mure et le Drac Postcard.” RICHES of Central Florida accessed April 22, 2019, https://richesmi.cah.ucf.edu/omeka/items/show/6612.